Tiffany Hartley emerged on CNN’s Anderson Cooper 360 yesterday after her 16th hour of interviews at the Mexican Consulate in McAllen, Texas. Hartley recounted the events of September 30, ending with the alleged murder of her husband David. Ms. Hartley gave both new testimony and confirmed her previous statements according to reports from the Mexican Attorney General and Ms. Hartley herself, without the presence of an attorney. According to several statements from Hartley, David was shot “off his jet ski” while the couple was returning from the Mexican side of Falcon Lake, where they briefly took pictures of the historic church on Old Guerrerro. Neither David Hartley nor his Sea Doo watercraft have been recovered. One of the most baffling aspect of the case, is the fact that Ms. Hartley claims the pair were shot at at as they were driving their jet skis away from alleged “pirates” they both waved a friendly hello to, seconds before. Tiffany Hartley was uninjured in the attack, and her jet ski was not hit in the gunfire. Although media was alerted last week that tests on a possible blood source on Tiffany’s life vest were due back that afternoon, we were quickly told there would be no updates about the possible blood evidence at this time. This afternoon, blinkoncrime Editor spoke with Chuck Smith, owner Smith Marina USA about specifics of the Sea Doo RXT. ..Your correct, the RXT has a chip in the starter that is electronically programmed to “match” the owners lanyard key. If he was wearing the lanyard, whether attached to his vest, or in some cases the arm, and he was thrown off the ski, it activates a kill switch and will not start without the key it is programmed to without a factory reprogramming, which of course, one would need the paperwork for. In short, no matter what, they would need his key to start it. Blink Question: What if he was not attached to the key, and he was shot and flew off the unit “in motion”, this would not shut the engine off, correct? CS: Correct. The ski would continue in the direction the handlebars were pointing and continue to throttle in that direction. Blink: How hard are these models to sink? CS: Virtually impossible. I have never actually heard of, or seen one, sink to the bottom. The way the Coast Guard standards are now with these, they have hulls similar to boats. Blink: Could enough bullet holes sink it? What about if the contiuum– could that have caused it to flip? Could anyone right it? CS: No, not unless we are talking morter rounds. I guess in theory an automatic weapon could put enough holes cut it in half if that was the goal, but again, your still going to see shards of fiberglass all over the water, remnants similar to a boat accident or crash. Again, under these circumstances, I don’t see how he could flip it, but if it were, again, harder to see because the bottom is black, but any SAR or Coast Guard deployment knows what abnormalities to look for on the water surface. It would be next to impossible to “right it” in deep water. It would be more likely they would drag it to shallow water. CS: Absolutely. There is some after factory devices, similar to lo jack, but the engine and parts are expensive and could easily be sold that way. Blink: He was wearing a PFD I. In your opinion is that keeping him afloat until he is located if he was left in the water? CS: Absolutely, unless it was removed, or he and the vest were removed from the water, he would be floating, yes. 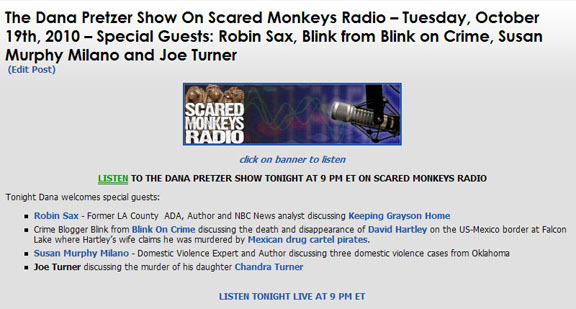 As announced this morning on Dana Pretzer commentary, Blink, Editor In Chief of blinkoncrime.com will be discussing the Hartley case this evening live at 9PM EST on Scared Monkeys The Dana Pretzer Show. According to his wife, Tiffany Young-Hartley, who called 911, David Hartley, 30, was gunned down by Mexican pirates while the couple ventured across the Falcon Resovior lakes US border to take pictures of the “Mexican Atlantis” or Old Guerreo. Hartley says her husband was shot in the head and as a result “flew” off his jet ski while the couple was returning from the landmark on the Mexican side of the lake, after taking pictures. She goes on to say she became aware of 3 different boats chasing down the couple only after she saw bullets hitting the water next to her. As she turned around to see where they were coming from, she claims she witnessed her husbands murder. 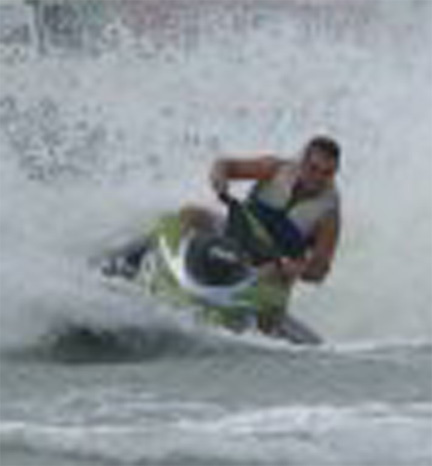 David was driving a new Sea Doo RXT ski that can climb from 0–30MPH in 1.7 seconds and is capable of top-end speeds of over 60 MPH. Blinkoncrime.com has not been able to confirm which model Ms. Hartley was driving. The couple had been on at least one earlier jet ski jaunt while still in Mexico, but was cut short due to a mishap with David’s craft on June 20th. According to his wife, David was face-down in the water, wearing a life vest, after he was shot. Despite the horror of what she had just witnessed and astonishingly avoiding injury to her or her watercraft, she circled back around, jumped off her jet ski, and turned her 250 lb. husband upright to observe the gunshot wound to his forehead. You read that correctly, according to Tiffany Hartley, while being chased from behind, David was shot from the front. Hartley maintains this is when she attempted to load him onto her jet ski, and also when two of the three boats were now positioned in front of her.